The Orange County Republican has also drawn more than a half-dozen Democratic challengers, some of whom have raised more money than the 15-term congressman. SANTA ANA, Calif.–Rep. Dana Rohrabacher was already having a tough election year. The Orange County Republican has drawn more than a half-dozen Democratic challengers, some of whom have raised more money than the 15-term congressman. Election handicappers declared his race a toss-up, protesters have shown up at his home and district office, and Rohrabacher’s name has frequently come up during the investigation into Russian election meddling because of his connections to key figures in the inquiry. Then Scott Baugh, a well-known Republican who spent more than a decade leading the county party, decided to run against him. As the GOP works to protect vulnerable incumbents whom Democrats want to oust in order to regain control of the House, Rohrabacher’s longtime local support network is starting to buckle. “I’m just looking for some strong leadership out of the 48th Congressional District, somebody that represents the gravitas of our location,” said state Sen. John Moorlach, who has endorsed Baugh. Moorlach and other prominent Republicans, such as Pat Bates, the GOP leader of the state Senate, refused to sign onto a letter the Orange County Republican Party circulated asking Baugh to abandon his bid, which they said was “divisive and presents an unnecessary distraction.” More than two dozen officials, including House GOP Leader Kevin McCarthy, Reps. Mimi Walters and Darrell Issa and several state legislators added their names. The lack of full party support for Rohrabacher is a stunning break with tradition in a year when Republicans are on the defense. Fred Whitaker, chair of the Orange County Republican Party, said he tried to change Baugh’s mind. “It’s disappointing,” Whitaker said. “I need (Republicans) focusing on races where I actually have to beat Democrats,” including two open seats, where Reps. Ed Royce and Issa, are retiring. Baugh and Rohrabacher were once friends. Baugh and Rohrabacher’s wife were both charged in connection with a 1995 scheme to recruit a decoy candidate to split the Democratic vote and help Baugh get elected to the state Assembly. Rohrabacher’s wife, who is also his longtime campaign manager, ultimately pleaded guilty for her part in the plan. The charges against Baugh, who paid $47,900 in campaign finance penalties, were eventually dropped. Rohrabacher did not respond to multiple requests for comment. In Rohrabacher’s coastal Orange County district, which stretches from Seal Beach to Laguna Niguel, registered Republicans outnumber Democrats 41 percent to 30 percent. Rohrabacher easily won reelection in 2016, but with 25 percent registered as independents and a surge in Democratic enthusiasm, the district is far from safe for Republicans. A recent poll from the University of California, Berkeley Institute of Governmental Studies showed 51 percent of likely voters said they were disinclined to re-elect Rohrabacher. On issues including Deferred Action for Childhood Arrivals and offshore drilling, the poll suggested Rohrabacher’s constituents are increasingly landing on the left. There’s a bright spot for Rohrabacher and Orange County Republicans: Baugh’s candidacy could shut all eight Democratic challengers out of the race after the June primary, which will advance the top two vote getters to the November general election. But a total of six Republicans, including Baugh and Rohrabacher, will also be on the ballot, potentially further splitting the Republican vote. Democrats have said privately that they don’t believe Baugh can siphon enough votes from Rohrabacher to snag a spot in the top two. Some Republicans’ frustrations with Rohrabacher’s penchant for controversy and bombastic style have been brewing for years. They have privately said the congressman is ineffective, inaccessible and out of step with local issues. Rohrabacher, once a speechwriter for President Ronald Reagan, has long thought of himself as a maverick, demonstrated by his fervent support for Russia and marijuana legalization. His opponents, including Democrats Harley Rouda and Hans Keirstead, often seize on his off-the-wall statements. In the past several months alone, he has suggested Russia was not involved in the theft of Democratic emails after meeting with WikiLeaks founder Julian Assange, called the violence at a white nationalist rally last year in Charlottesville, Va., “a total hoax” and speculated that “criminal illegal aliens” could be behind the shooting Tuesday at YouTube headquarters in San Bruno, Calif. Despite the county party’s official backing for Rohrabacher, the support he enjoys from the party establishment has typically been more muted than for more well-respected members. In the 30 years he’s been in office, Rohrabacher has never chaired a House committee, unusual for an incumbent of his tenure. 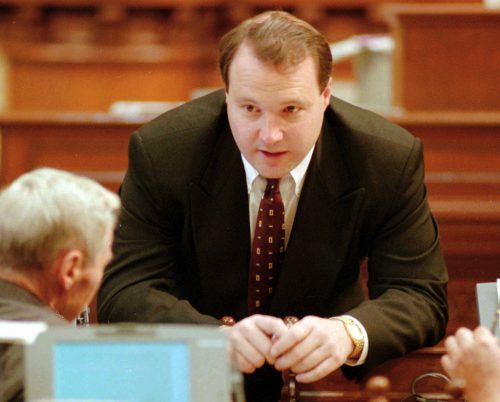 “I can’t think of anything in particular that he’s accomplished recently,” said Mark Bucher, a Baugh donor who sits on the central committee of the very county GOP that condemned Baugh’s bid. One high-ranking county GOP insider who has worked for local officials and requested anonymity to speak frankly about Rohrabacher, said the congressman’s office was frequently unresponsive when legislators reached out on policy issues and is often one of the last incumbents to contribute to party fundraisers or joint campaign efforts. Rohrabacher appears to be taking the challenge seriously and looks as if he’s trying to mobilize loyal supporters while still appealing to more liberal voters. By the end of last year, he had raised more money than he has for any campaign in a decade. He made a rare appearance last week at the Orange County Board of Supervisors to speak on homelessness and California’s “sanctuary state” policy. His speech was laden with conservative-baiting rhetoric. “This flow of illegals … has brought down the quality of education,” healthcare and housing, he said. He’s tweaked his campaign web site, adding a section touting his “2017 legislative accomplishments” and removing one that previously asked visitors to “STAND WITH TRUMP,” who lost to Hillary Clinton in Rohrabacher’s district in the presidential election. He voted against the Republican tax bill and the most recent House spending plan, citing the potential increase in his constituents’ tax bills and ballooning federal deficits.